Biography & Genealogy: Edward Magruder Tutwiler, Class of 1867. New Market Cadet. Born- Oct. 13, 1846 in Fluvanna Co. Va. Father- Col. Thomas Harrison Tutwiler; Mother- Harriet Magruder Strange. Pat. Grandfather- Martin Tutwiler; Pat. Grandmother- Martia Shores. Mat. Grandfather- Col. Gideon A. Strange; Mat. Grandmother- Harriet Magruder. Married-1st- Mary Jeffery daughter of Dr. Thomas R.W. Jeffery; 2nd- Margaret Chewning, daughter of John W. Chewing. Children- 1- Temple W. Tutwiler; 2- Edward Magruder Tutwiler, Jr.; 3- Herbert Tutwiler (All from 1st Marriage). Entered VMI- Jan. 13, 1864; Graduated- July 4, 1867 standing 6 in class of 11. Member of the Alpha Tau Omega Fraternity. 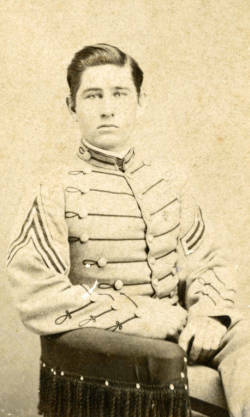 Civil War Service- Private in Co. D of Corps of Cadets in the Battle of New Market. Career- Civil Engineer; President of Tutwiler, Coal, Coke and Pig Iron Co. in Birmingham, Ala. Died- April 19, 1925 while aboard the "Empress of France" after having visited his son Temple in India.